Here’s a list of events in Zagreb this year – and wow, what a line up…visitors will be very busy! We’ve listed the proper dates of events where possible – some events have yet to be finalised/publicised fully so we’ve listed them under the month as appropriate; likewise, we add more events to this list all the time, so check back regularly. If there’s anything you think we’ve missed (or if you run an event and would like to see it here), then do please email us. 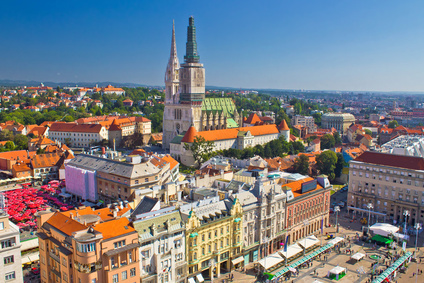 The FIS Ski World Cup Snow Queen Trophy will take place in Zagreb (well, on the mountain above the city!) on 5th (women’s race) and 6th (men’s race) January 2019. The event is unique as it is the only Ski World Cup race to take place in – or rather, on the outskirts of – a major city. With around 25,000 spectators lining the slopes for the races, this is also one of the best attended races on the ski calendar with an amazing atmosphere. If you are wondering about the name (and the fact that there are women’s and men’s races), the event is named in honour of Janica Kostelic, Croatia’s greatest ever skier! Noc muzeja (or “Night of the museums”) will be held across the country on 1st February 2019, the 14th edition of this very special event. There’s free entry to museums, as well as special exhibitions, workshops, events and more taking place, and many of Zagreb’s museums take part. Tom Odell will be performing at Tvornica Kulture on 10th February 2019. The Zagreb Boat and Sport Show is now in its 28th year and is to be held at the Zagreb Fair (‘Zagrebacki Velesajam’) venue with a variety of boat, yacht and other marine sport exhibitors. It is being held over five days, from 20th to 24th February 2019. Zagreb Dox, an international documentary film festival, will be in its 15th year in 2019. Taking place at the MoviePlex cinema in the Kaptol Center, there are several themed programs as well as a competition for the best documentary. It is to be held from the 24th February to 3rd March 2019. Restaurant Week (or Tjedan Restoran in Croatian) actually takes place over a week and a bit in Croatia’s capital city in March each year. A number of restaurants will be taking part, each offering a special Restaurant Week three-course menu (and sometimes with a glass of wine too!) for a special price. This time round, it will be held from 15th to 24th March 2019. The 13th Festival of Tolerance (Jewish Film Festival) is to be held in early April. The 24th International Caricature Exhibition should take place at the end of May. The 54th Floraart Festival – an international flower and garden event – will take place by Lake Bundek late May to early June. Each year, a great number of Croatian exhibitors and a handful of international ones also take part. Ljeto na Strosu (“Summer on Strosu”) is a series of musical and other fun events on Strossmayer Boulevard in Zagreb’s Upper Town. It take place every summer from roughly the end of May to the beginning of September each year. C’est is d’Best is a festival in which street performers – musicians, actors, dancers – take part in various performances at assorted locations throughout the city. The 34th Oldtimer Rally – featuring a host of classic cars – is organised by the Oldtimer Club Zagreb, with the cars taking to the streets of the capital in early June. Animafest, as the name might suggest, is a world festival of animated film which was first held way back in 1972. This year’s festival will be held from 3rd to 8th June 2019. The Dance Week Festival in mid June will showcase a wide variety of contemporary dance performances from both Croatian and international troupes. The Pop Up Summer Garden (read about last year’s event!) runs from mid June until mid-September. It features live music, film, workshops and food and drink in the pretty Tuskanac woods. The 28th Days of Croatian Film should take place in mid-June. Vinoljupci/Winelovers’ Street is a three-day event offering tastings of wines from across Croatia. Held on Kurelceva Street (very close to the main square), entry is free and glasses of wine are 8 Kunas each. Perforacije (“Perforations”) is a week of live art featuring artists from Croatia and other Balkan countries. It is held in mid June. The 4th Project Design District Zagreb should be held in mid June; designers, architects, artists, curators, musicians, writers and more gather in the ‘creative zone’ around Marticeva street for a number of different events. Lake Jarun is home to the INmusic Festival, a three day music event in a pretty setting in the southwestern part of the city, with a host of international bands and stars performing. It’s a great way of experiencing a music festival right in the heart (just about) of a European city – and is one of the top events in Zagreb each year! The 13th edition of the festival will take place from the 24th to 26th June 2019. Artists appearing include The Cure, Foals, Frank Turner and more. Read more on our guide to the Festival here. Rock legends Whitesnake (Visit Croatia is a big fan!) will be playing Salata on 3rd July 2019. The Fantastic Zagreb Film Festival is a festival dedicated to “fiction film” – i.e. sci-fi, horror, thrillers, suspense films and similar. Film screenings normally take place in several cinemas in the city throughout the summer. Veceri na Gricu (Evenings on Gric or Gric Evenings in English) is a long-running festival (in its 38th year in 2019) featuring a series of concerts in the Upper Town. The concerts should take place throughout July and August. The magical Dvorista (“courtyards”) takes place in those very (usually unaccessible) areas in the Upper Town of Zagreb in mid July, with music, gastronomic delights and much more. The International Folklore Festival – over the course of five days – brings together folklore groups from Croatia, Europe and further afield for performances, workshops, concerts, exhibitions and a handicraft and souvenir fair. Some performances are held on Ban Jelacic square. This year’s Festival is the 53rd edition. We sometimes get asked why we never feature any August events for Zagreb! There are a few – check out some of the listings in the months above for events that ‘start in June’ (for example). Truthfully, there’s not many happenings as visitors and locals alike have departed for the coast for summer holidays! The 52nd International Puppet Festival will take place 13th to 20th September 2019 with both Croatian and international puppetry groups taking part. The 12th ZeGeVe Festival of Sustainable Living should take place on Zagreb’s main square (Trg Ban Jelacic) in early September. Michael Buble will be performing at Arena Zagreb on 16th September 2019. RujanFest will take place over ten days in mid/end-September by Lake Bundek. It’s a combination of a gastro (and drinking!) event, featuring Croatian cuisine and live music with many Croatian artists from different genres performing. Last year was the festival celebrated ten years. The World Theatre Festival should be held in mid- to late September. The Zagreb TourFilm Festival – a festival of international tourist films – should be on towards the end of September. The 28th Zagreb Marathon will be held on the city’s streets on 13th October 2019. The Zagreb International Chamber Music Festival sees various classical concerts taking place over a week during mid-October. The 13th Pssst! Silent Film Festival – with both domestic and foreign films – will be on in early November. The Zagreb Film Festival showcases films from debut or new film-makers from across the world each year in this month. Prizes are awarded in several categories. The seventh Zagreb Harp Festival should be held towards the end of November. The 17th Human Rights Film Festival should take place in early December, promoting the subject of human rights as depicted in film. As with many other places in Europe, Christmas celebrations will take over much of Zagreb in December, with decorations, live outdoor music, festive events and more. Advent Zagreb is a good website to check what’s happening where – if nothing else, head down to the main square (Trg ban Jelacic) to join in with the festive mood there! Zagreb won the European Best Destinations Best Christmas Market in 2016, 2017 AND 2018. It’s a great time of year to be in Zagreb! Trg ban Jelacic is also the main focus for New Year’s Eve celebrations, with a open-air concert and fireworks.